Third day of the trip was promising to be fun, because I’ve seen the works of 2 studios we were going to visit and like usually with Italians, they were top notch. Pedretti and Torcoli. Pedretti is actually also a family business. 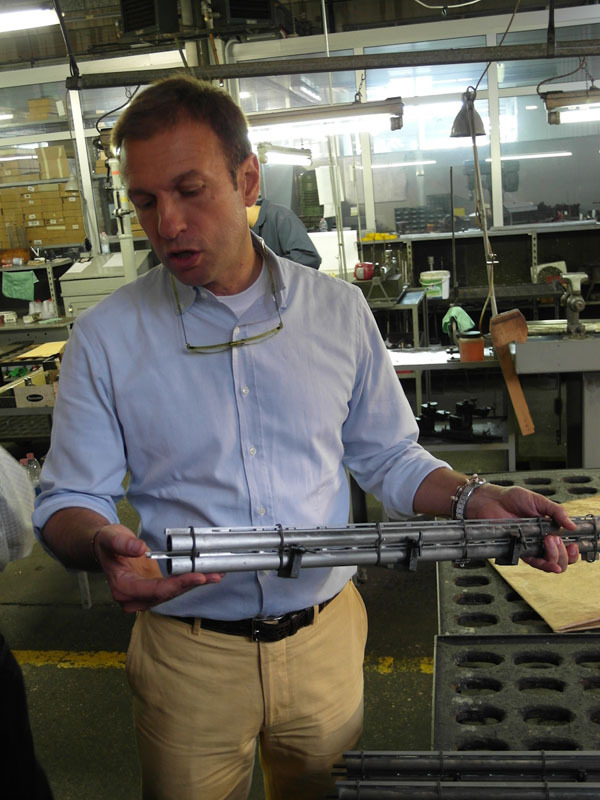 Gianfranco and Stefano Pedretti – father and son, plus quite a few more engravers at their studio. About a year ago I bought a book about them, so I kind of knew what to expect and was familiar with their style. They are probably most famous for their hunting scenes with very realistic dogs. My guess is, that in their book more than 50% was dedicated to dog engravings. 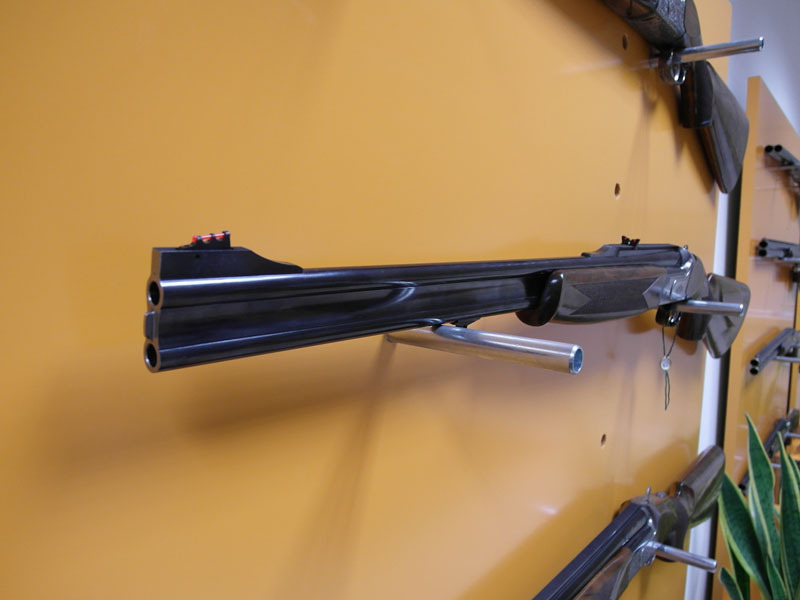 As is the case with majority of Italian engravers, most of the work is done on hunting guns and both Pedrettis are avid hunters, so their hunting scenes are very realistic. They’ve been there and done that, know what hunt is like. So this gives a good opportunity for nice scenes. 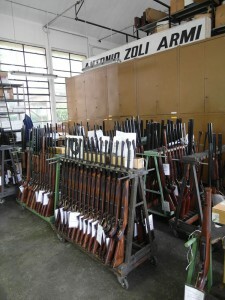 Next visit was to a proper gun factory – Zoli. So far I’ve never been to a fun factory before and it was really exciting. I’ve wondered many times how do they do some parts, like barrels. How do they tune, make them precise etc. Find out these things I did. 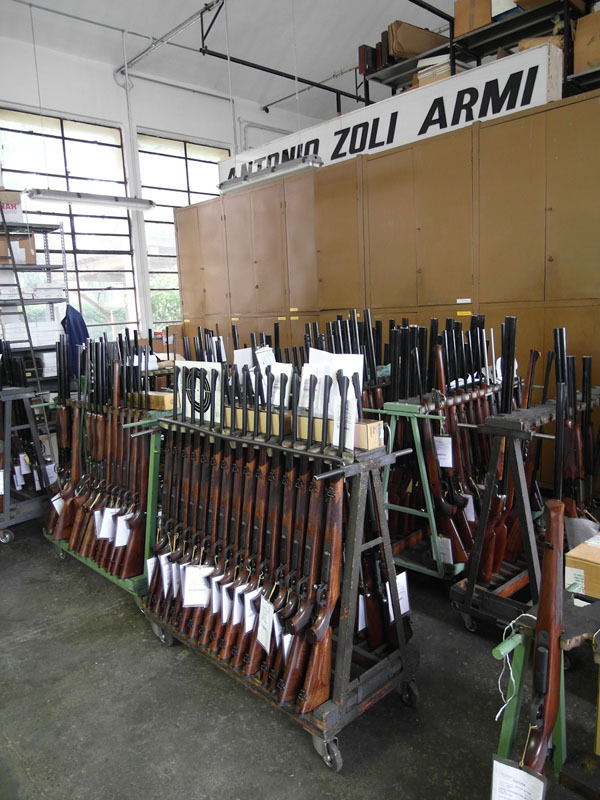 In Zoli factory a lot of work is done by CNC machines. 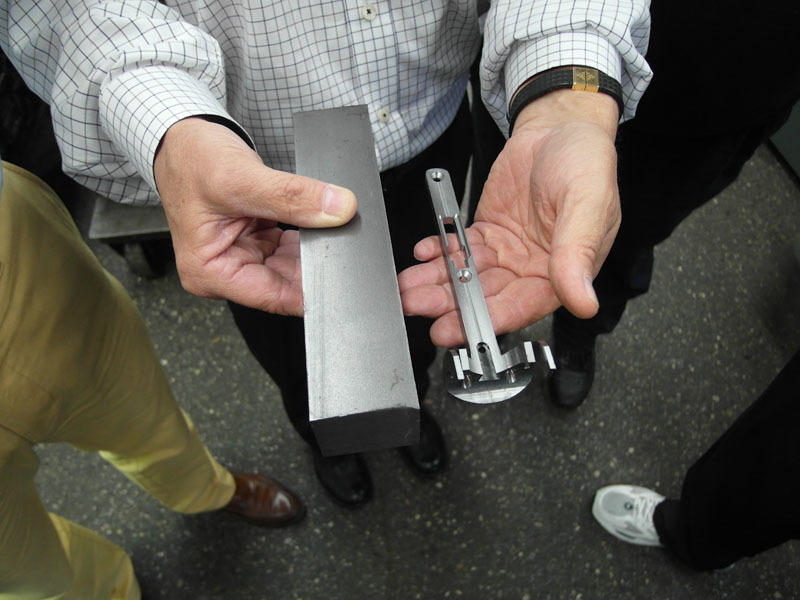 For example gun frames are first hot-forged to rough size and dimensions and after that CNC takes over. I think there were around 20-30 big CNC mills doing all kinds of different parts. All of the parts are made from one solid piece of steel and nothing is cast, so this gives better reliability and strength to the gun. President Paolo Zoli explaining how barrels are made and soldered together. Torcoli is famous because of his fantasy engravings. A style where usually women, animals and plants are kind of fused together, creating beautiful fantasy scenes. 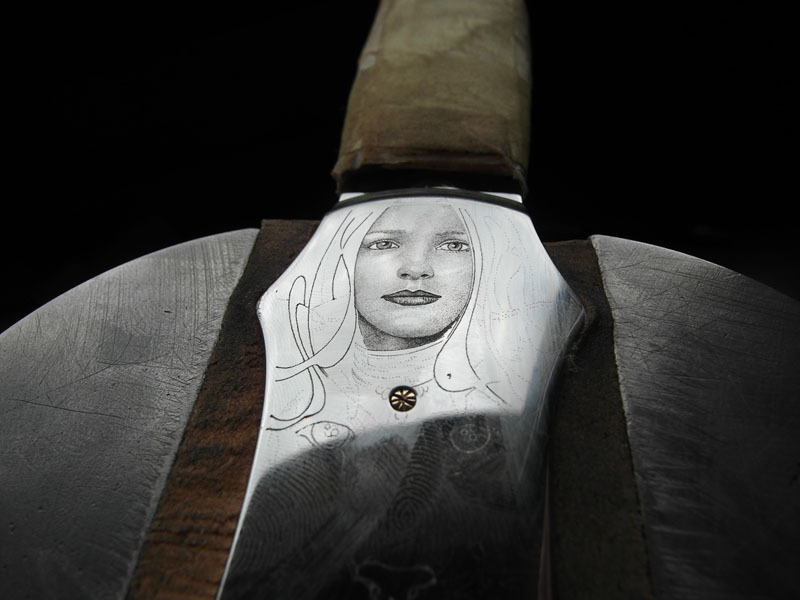 Fortunately a lot of his work is done on knives and when the knives are made for US customers, they are more likely to appear on internet. So I knew some of his work. 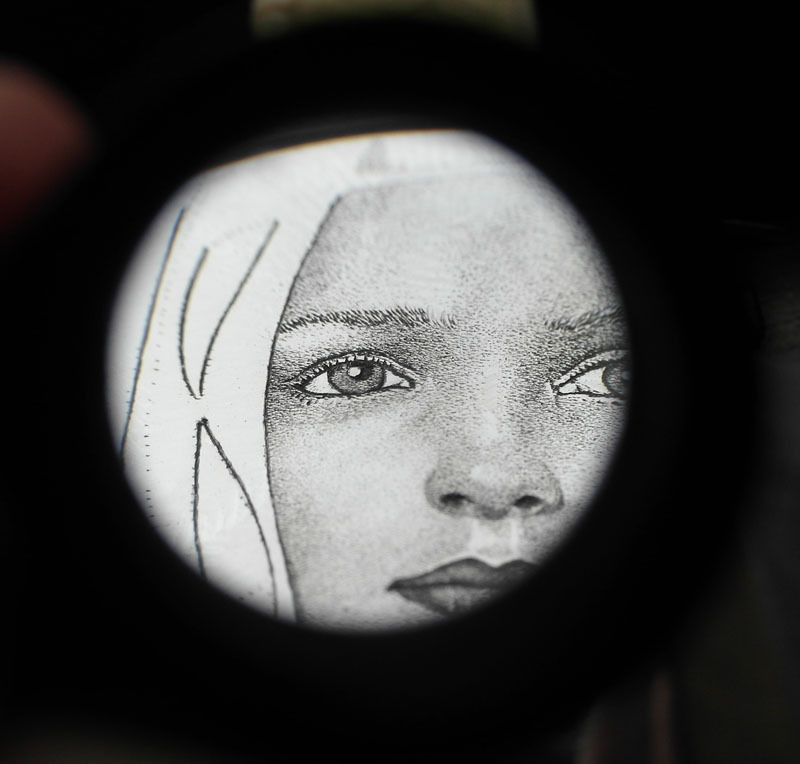 Here’s a close up shot through his Zeiss loupe. I did try to take photos of the engravings as close as possible for study material. This one was most successful. Our last visit for the day was Dassa studio. Again family business, but this time they were brothers. They are most known for their enamel work, or color engraving. The results are quite striking and very detailed, unfortunately they didn’t have any works to show in real life, only photos.